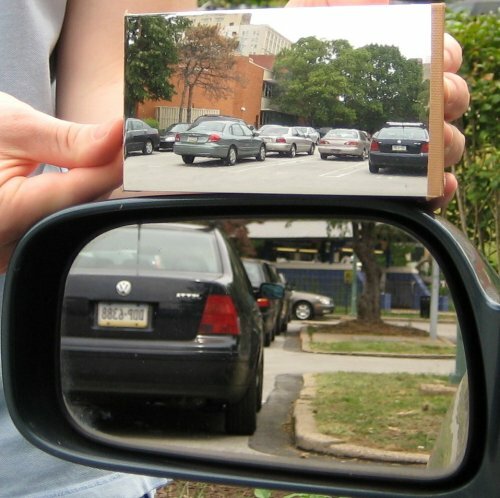 A new mirror design combines math and optics to create a view without blind spots, but thanks to government, you'll likely never see one on your car. Automotive side mirrors have changed little in decades. On nearly any car you'd care to name, they are squarish reflectors which cover little area and often leave huge blind spots for the driver. In Driver's Education classes, we're taught to "look over our shoulder" in order to make up for this shortcoming, despite many newer cars having little to no visibility from that angle either. A new innovation wants to change all of that, but government regulation prevents it from being used. While some of us have taken to adding round, convex mirrors to the corners of our side rear views in order to enhance the breadth of their vision, most people just live without seeing what's going on behind them clearly. This results in over a thousand deaths a year - an estimated 4% of all automotive fatalities in the U.S.
A new mirror design from Drexel University mathematics professor Dr. R. Andrew Hicks wants to change that. He's received a patent for a new mirror design that will defeat the purpose of all those fancy (and expensive) blind spot detection systems being added to high-end cars today. Dr. Hicks came up with an algorithm that creates a mirror surface that can see a much, much broader view than a standard flat mirror of the same size. Dr. Hicks' mirror is technically a curved design, but it uses a combination of refraction and multi-surface cutting to create a 45-degree viewing area. A current mirror has a 17-degree view, for reference. The design creates this view without the distortion normally associated with curved mirrors. But that won't stop government regulations from preventing it being used as a factory-installed option. The National Highway Traffic Safety Administration (NHTSA) requires that the driver's side mirror be flat. Not that it's view be flat, but that its surface be so. Given the long, tedious, and onerous process of changing bureaucratic law, it's highly unlikely that a professor from Drexel is going to get it changed so that his innovation can become standard safety equipment on today's automobiles. The best we can hope for is an after-market offering, but don't expect this to get widely adopted anytime soon. Years back I recall one of these being in the after market. I remember what you're talking about. They were sold as mirror "stickers" that went over the glass of your current mirror and created a slightly convex view to broaden the perspective. I remember adding one to bottom of the tall mirror on my Ford Ranger pickup. I remember when headlights had to be sealed beam type; preventing the progress to brighter, efficient, better reflected units. The law finally got changed. All we need here is some anti-auto industry self-interest group to annoy the government into mandating it. How I like this comment. Bought and paid for government regulations are the biggest barrier to improving technology there is! Most people are under the illusion that government regulations are there to keep us safe. The reality is, they're there to keep competition at a minimum.